My blog is currently updated through my GoodReads author profile. “Barney and Barry, The Hitchikers” placed as a Finalist in the 2015 Amsterdam Film Festival Short Screenplay Competition, as a Finalist in the 2015 Honolulu Film Awards Short Screenplay Competition and as a Quarter-Finalist in the 19th Annual Fade In Awards Short Screenplay Competition. Stayed tuned on that one because this contest isn’t over yet!! 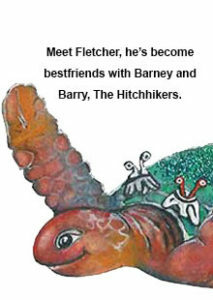 “Barney and Barry, The Hitchhikers” is now available as an ebook through smashwords.com. This increases the ebooks distribution so you can now download directly thru smashwords, Apple, B&N, Scribd, Oyster, Kobo, Amazon and more!! You can also special order the paperback through most book stores or online at Amazon. Available online (Amazon, Smashwords, B&N, Apple, Sony, Kobo, Etc) as an ebook and through Amazon and special order through your favorite bookstore in paperback!! “Seaspan” is not part of the MySeaBuddies children’s series. It is geared toward more of an adult reader. Twenty-five years ago Jack and Kelly met. He can’t remember. She can’t forget. I participated in the 11th annual OCCBF of Sunday, September 28th with an author’s table and to speak on their Animal Stage to discuss my book, “Barney and Barry, The Hitchhikers”. I want to thank everyone who stopped by the table for their support. The prize wheel was a big success with lots of fun giveaways of ebooks, pencils, stickers and “Hitchhiker Bubbles”! For more information on the annual festival please check out their website at: http://www.kidsbookfestival.com . A wonderful underwater universe with lovable and enduring characters.